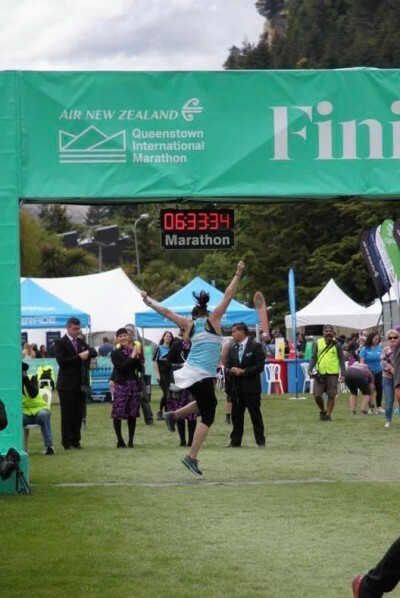 Mother runners – the running journey of a mum and her daughter. Episode 2 – Sandi’s Journey. When I was young I was very active however when I got married and had 3 boys and a girl this was all put on hold. It wasn’t until my youngest, Mery, finished high school that I started exercising again. I was overweight and wanted to lose weight and get fit and so my running journey started. I would walk 50 steps then slowly jog 50 steps. My first event was Bridge to Brisbane 12 ks walking. Slowly the weight started to go and I built up my fitness and stamina. My daughter Mery joined my many attempts to stay fit including bootcamps, boxing, water polo (that was a hoot I couldn’t even hold the ball properly while Mery was a gun at it) and indoor beach volleyball. However she drew the line at running. I loved running as it was my go to place when things got me down or I needed to think. I started to combine my running with holidays, so when I visited my son in America I entered the Los Angeles Marathon. I found running was a fantastic way to really see what was around us. On the grapevine I heard about Parkrun and I was hooked. Eventually I was able to convince Mery to come, highlighting the social side of Parkrun. It was a slow process but finally she got hooked. We even got to celebrate our 50 Parkruns together as well as volunteering together. As your children grow up and get their own lives it is hard sometimes to spend quality time with them where you can chat and debrief. Running together became “our” time. We have had our ups and downs individually with our running but I believe it has brought us closer together and really appreciate what each other has to give. Mery wrote about us holding hands together crossing the finish line of the Twilight half marathon after I had gone back to find her. I was so proud of her, no real training but she dug deep. The last hill had got to me and I walked up it but not Mery, she ran that hill, her determination blows my mind. 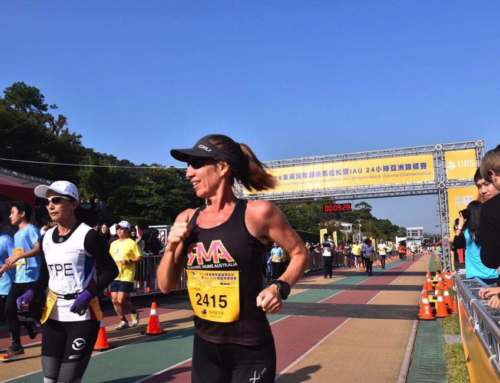 That determination held her in good stead when she decided she would like to do her first marathon at GCAM16. I told her I would be honoured to run with her and share in the experience. Unfortunately while I was doing a speed session during my lunch hour I injured myself about 3 1/2 months out and I was not able to run properly until the week before. It was heartbreaking not to be able to train and run with Mery but having given my word I would do the marathon with her. I kept my fitness up with mind numbing 3 hour sessions of water running or cycling on the gym bike. I knew we had this as the two of us together was greater than us individually. What I hadn’t told Mery was that when I run I had constant pain but Paul (physio from Body Leadership) who got me to the start line said that as long as it didn’t get to be an acute pain I could keep running with her. Paul knew how much it meant for me to be running side by side with my daughter on her maiden marathon attempt. People talk about the wall at 32ks well Mery hit that wall and many more. At one stage she was so exhausted she could hardly walk. I put my arm under hers and helped her through that time. It was so inspiring seeing her fight and win her battles during this event. At 3 ks to go she said this will be her one and only marathon (LOL). When we were 2ks out from finish line I told her to be prepared for the last kilometre as it would be emotional, all our friends and strangers would be lining the side yelling and screaming encouragement to us. In true Mery style she asked if we could walk a little. When I asked her why she said she needed to adjust herself so she looked her best. As we came up to the finish line I was so proud of her my heart hurt. She had done it. It was an incredible and heart swelling experience to share the highs and lows with her on this run. Running has given so much to us and our relationship together. 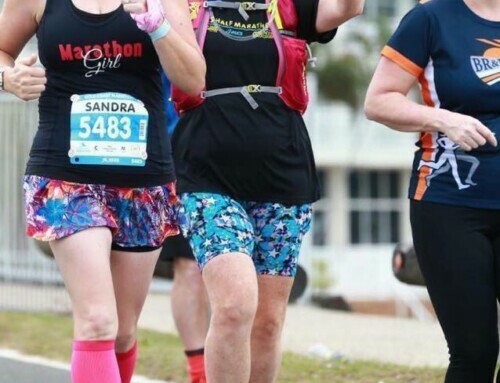 At GCAM16 Mery said no more, marathon but when some friends organised a shopping centre marathon this past week she joined in or actually I dobbed her in. Once again no real training for Mery. It was a blast we ran and walked and chatted for 42.2 ks around Chermside shopping centre. I am very lucky that she indulges me in my craziness. We have different goals for this year and do not run always together but the time running together is always cherished. I have gone into trails and am slowly convincing Mery to do some, however it is hard for her to organise as she has a young daughter and we have to travel to do trails. This month I will be travelling to Tassie to do the inaugural Gone Nuts 101k trail event whilst Mery will be doing her first triathlon event at Bribie. 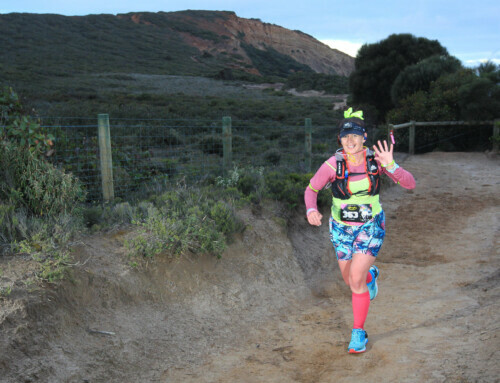 However the two big ones for us both this year are GCAM17 (unfinished business for Mery she wants a sub 5 hour) and I have convinced Mery to not only do her first ultra but for it to be trails… Blackall 50. It’s going to be a BLAST!!!! You girls never cease to amaze and inspire me. 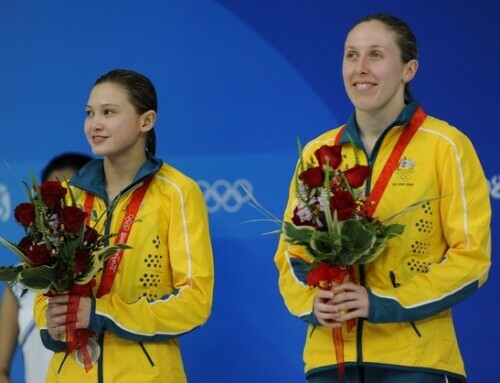 Looks like a lot more successes ahead for you both…. Amazing woman and an even more amazing sister! Got me into being more active again and not a bear in sight….